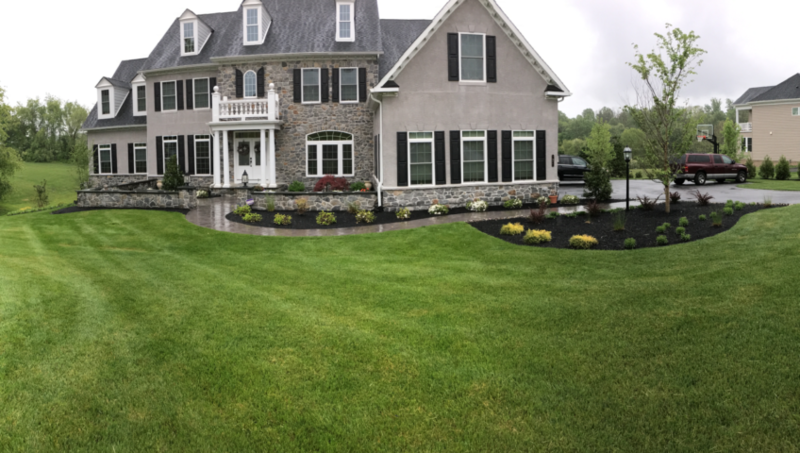 A green lawn adds to the curb appeal of any home in Wilmington, DE. However, an unkempt lawn can detract from the appearance of your home. One of the things that is essential for a green lawn is proper mowing. While this appears to be a relatively simple chore, knowing the right mowing techniques can help in keeping your lawn lush. When mowing your lawn you need to ensure that the height of the blades is just right. This is because taller blades ensure deeper roots, helping to protect the lawn from bugs and weeds. Moreover, the deeper roots help the lawn in surviving drought conditions better. Additionally, you should never cut off more than a third of the grass blade in height. If you miss a mowing session, do not cut more of the grass the next time. Instead, reduce the height of the grass slowly until you reach the desired level. Keeping the grass too low also means that you are cutting off too much of the nutrient producing leaves or blades of the grass plant. Leaving the grass higher in the summer will also help the soil in retaining moisture as the higher blades provide additional shade. The frequency with which you mow the lawn depends on the growth rate. During the summer, you might need to mow it once in five days, while during the slow growing period mowing once in ten days is sufficient. The rest of the year, you should be prepared to mow the lawn once a week. There are two types of mowers – reel mowers and rotary mowers. Reel mowers use a scissor like action and are great for cutting the grass to less than 1.5 inches. They are needed to prepare golf courses and sports arenas. Home owners who leave the grass blades longer can use rotary mowers. Most rotary mowers also come with in-built mulchers that help increase the nutrient content of the soil using the cut blades of grass. Apart from this, one should only mow the lawn when it is moisture free. This helps avoid clumping of the grass and soil compaction. Additionally, run the mower from a slightly different angle each week in order to avoid soil compaction caused by the weight of the mower. Before you mow your lawn, select the right mower, ensure that the blades are sharp, and set the height properly. You also need to ensure that the lawn is dry and that the mower does not take the same path each week. Lawns in Wilmington, DE can wither and dry up even with proper watering if they do not get sufficient fertilizer. Most lawns require nitrogen, potassium, and phosphorus. However, the proportion in which they need these minerals as well as the quantity of the fertilizer required depends on the soil type. The first step to fertilizing your lawn is assessing the soil quality. You can get the soil tested at any of the state horticultural laboratories or do it yourself using a test kit. This will help you determine the quantity of fertilizer necessary. The most economical and organic fertilizer for your lawn is mulch. Simply leaving the grass clippings after mowing your lawn will help improve the nitrogen content inexpensively. One can also use chemical or synthetic fertilizers. These are marked with three sets of figures signifying the volume of nitrogen, potassium, and phosphorus they contain. Typically, the lawn needs half the amount of potassium as nitrogen and only quarter the amount of phosphorus. You need to use a fertilizer formulated for lawns. Excessive application of chemical fertilizers can cause grass burn and other issues. Chemical fertilizers are also classified as slow release or quick release. Slow release fertilizers are not water soluble and release the chemicals over time, ensuring that the lawn looks astounding for a longer time. Quick release fertilizers are water soluble, make the grass look green quicker, but are not effective in the long term. They are less expensive than the slow release fertilizers. Apart from knowing how much fertilizer you need to spread, you also need to know when to spread it. In general it is not advisable to apply the fertilizer in the growing season. This is because the grass will in any case grow quickly at this time. Instead you need to apply the fertilizer in fall. This will help in ensuring that the grass continues to thrive during the winter months and is lush in the spring. Depending on the fertilizer as well as the soil conditions, you need to apply it once a year or two or three times in fall. The actual frequency, the fertilizer required, and the amount needed can be determined with the help of your local lawn care center. Incorrect or excessive application of fertilizer on lawns can lead to excessive growth of weeds, grass burn, or fast growth of grass needing frequent mowing. 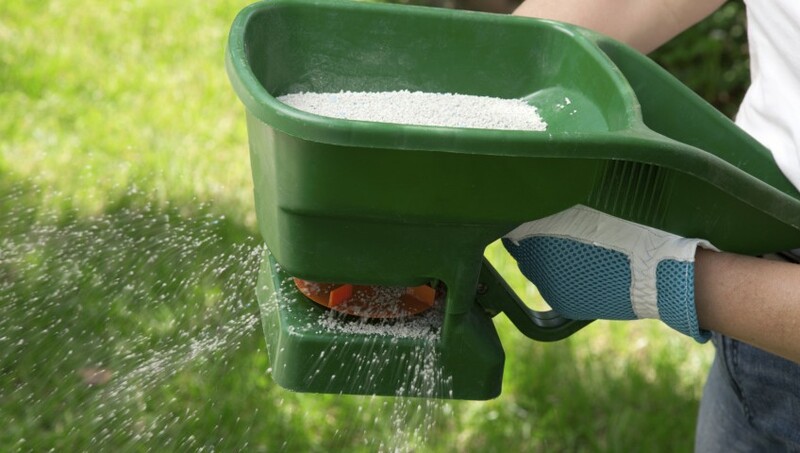 While applying fertilizer is essential for effective lawn care, you need to consult with a lawn care expert who can help you determine the best time and type of fertilizer for your lawn. This depends on the grass you are using, soil conditions, and the local climate. A lush lawn is a welcome sight. However, maintaining a glowing lawn can be difficult for many people as they are unaware of the basics of proper lawn care. One of the most important ways in which you can improve your lawn health is to water competently. You should water the lawn only when absolutely necessary. This means that in dry areas in the dry weather, you might need to water the lawn twice a week. Monitor the lawn and only water it when it displays signs of drought strain. Such stress is manifested when grass that is stepped on does not bounce back, the grass looks dull or yellow. Avoid watering the lawn after a rain or reduce the frequency if the weather is cool and moist. Frequent watering of the lawn will prevent the roots from going deep in search of water. This leads to damaged grass that cannot resist drought, pests, or other conditions. Moreover, frequent watering can lead to the germination of weeds. Thatch development is also a sign that you are watering the lawn more often than required. Another issue with everyday watering is soil compaction as the soil does not get time to ventilate. When watering a lawn, you need to ascertain that the water does not runoff. This will help lower water wastage and also ensure that fertilizer or pesticide is not dissolved and mixed with the water in the drains. The sprinkler should be set to provide an inch of water all over the lawn. You can measure this by setting up empty coffee tins around the sprinkler and measuring the time taken to fill it to an inch. In case the soil is compacted, finish watering when the water runs off and wait until the water is absorbed before continuing to water to the required inch. The best time to water the lawn is at dawn or just before it. If your sprinkler has a timer, set it to water the lawn before sunrise. This will ensure that the lawn receives cool water, instead of warm water. Also, the sun will help evaporate excess moisture and prevent the growth of mildew and rot in the roots. This will also help reduce the presence of pests in the lawn. Another part of proper watering is to ensure that the soil is able to retain water. Compacted soil needs to be aerated to ensure that it can absorb and hold moisture. For this, you can add appropriate mulch and other material to the soil to ensure that it can retain moisture for longer. Proper lawn care begins with appropriate watering regimen. While most people are aware that inadequate watering can prevent proper lawn growth, excess watering, frequent watering, and erroneous timing of watering can all lead to poor lawn growth as well. This means that you need to observe the lawn before you decide to water it, to ensure that it stays healthy . While everyone loves a golden garden, most people do not have the time to spend on rigorous gardening. Also, gardens that require a lot of watering can take up your time as well as cost a lot, especially in the hot months. However, you can still have a sterling looking garden if you incorporate these low maintenance solutions into your landscaping. A rock garden is low maintenance as the plants used are typically drought resistant and require less watering. Moreover, the rocks themselves add to the design element and are easy to maintain as they require no care. A grass lawn is considered an essential component of landscaping. However, it requires a lot of maintenance work – watering, mowing, weeding, application of pesticides and fertilizer, and so on. Instead, you can consider a lawn of clover. Clover is a living, green carpet under your feet and is easy to maintain. It is drought, weed, and pest resistant and does not turn brown when exposed to dog urine. The clover flourishes and grows so well that weeds do not have much chance of growing and it also fertilizes the soil with nitrogen. Another concern when landscaping is the inability to grow grass under trees and other shady spots. However, if your design still calls for a green carpet in such spots, consider covering the space with moss. This is a low maintenance way of keeping the place green. Another efficient way to have a simple garden is to plant the flower beds with drought-resistant perennials. By sowing perennials you can ensure that you do not have to plant a fresh set of plants each year. The drought resistant quality will ensure that they need less frequent watering as well. You can reduce the amount of time spent in watering your garden by installing automatic irrigation systems when you are planning the landscaping. This will allow you to set the timer of the sprinkler and proceed to enjoy your garden. Those living in areas where it snows heavily are conscious of the time and work needed to keep the driveway free of snow. Install a snow melt system as part of the landscaping and so you can eradicate this chore. Just switch on the system each time the driveway needs to be cleaned and watch the chore melt away. A green lawn is a joy to see and a fabulous location to unwind in or entertain. A well-maintained lawn adds to the curb appeal of your home and makes it look welcoming. However, with the busy lives we lead and the other responsibilities we shoulder maintain a great lawn requires extra effort. The first step to ensuring proper lawn care is to keep the lawn well watered. A lawn needs to be watered regularly and with the proper amount of water to ensure that it stays healthy. Too little water can lead to browning and bald patches, while over watering can lead to growth of weeds, fungus, pests, and also weak roots. Ideally a lawn should be watered only when completely dry and until one inch of water has been sprinkled over the entire surface. The frequency of the watering depends on the weather conditions. If it has rained or there is humidity in the air then you probably need to water the lawn only cone a week, while in the hot and dry months, the lawn will need to be watered more frequently. An untidy lawn detracts from the appearance of the home. Instead you need to mow it so that the lawn height is appropriate. Again, mowing the lawn very close will lead make it look bad. Also, you should take care that you reduce the height of the lawn by degrees to make sure that the roots stay strong. Most lawns need to have fertilizer applied twice a year, once in fall and once before spring. While chemical or synthetic fertilizers will make the lawn grow swiftly, they will not last long and you need to ensure that you do not apply excess fertilizer. Instead, you can opt for organic fertilizer or compost that will not only nourish the lawn but improve the ability of the soil to hold moisture, helping in the long term health of the lawn. Lawns can attract a variety of pests such as ants and mosquitoes. You can again select from synthetic or chemical pesticides and organic methods of keeping pests down. For instance, you can plant citronella on the borders of the lawn to keep mosquitoes away and enjoy the smell as well. Proper watering, mowing, and fertilizer use will automatically help control weeds in your lawn. However, if you find that you have an excess of weeds that cannot be removed manually you can opt to use weed control chemicals that target specific weeds. These should be applied in areas where there is an excess of weeds to ensure that your lawn looks and feels smooth and lush. There are many tools and equipment such as automatic lawn sprinklers with timers and special mowers that can be easily adjusted to mow the lawn to the desired height that make lawn care simpler. By installing sprinklers and setting the timer you will be able to water your lawn without having to find time for this chore in your busy schedule. In order for any lawn to look lush and smooth, it is vital that it be mowed frequently. The height of the grass has to be maintained at optimal levels to ensure that the lawn remains healthy even as it looks terrific. Proper mowing techniques include determining the right length of grass to cut, the frequency of the mowing, and the direction of the mower. When it comes to mowing, you need to determine how much you are willing to reduce the lawn height by each time you mow. This is because very short grass will dry the soil quickly and necessitate more frequent watering. Moreover, if the lawn is mowed very short the roots will not be able to grow deep, leading to grass that cannot survive dry conditions or pest attacks. At any given time you should also not cut more than a third of the grass height. This means if you have missed mowing the lawn for a couple of weeks during the growing season, reduce the height of the grass gradually by reducing only third of the height each time. In order to have a thriving and lush lawn you need to ensure that you are mowing it at the right frequency. Grass that is too short or long can both lead to weak roots. In summer, the peak of the growing season, you might need to mow the lawn twice a week. In spring and fall you must schedule mowing only once a week. Generally, in winter grass grows very slowly so you do not need to mow the lawn at all. When you mow the lawn you need to deal with the clippings as well. If you are mowing periodically and the clippings are short, you can leave them on the lawn as they will disintegrate and add valuable nitrogen to the soil, reducing the fertilizer requirement by 25 percent. If, however, you have missed a few mowing and the lawn is very high, you need to collect the clippings and mulch or compost it before returning it to the soil. A striped lawn looks much more attractive than a lawn that has been mowed without any design. To achieve this, simply fix on the pattern you want and move the mower in opposite directions to obtain the stripes. One of the other important factors that can affect the quality of your lawn when mowing is the quality of the blades of the lawn mower. If the blades are blunt or not sharp enough, the grass can be cut with ragged edges and not provide a smooth surface. Moreover, the grass can be damaged, leading to bald patches or browning. Inspect the blades of the mower periodically to ensure that the grass is not damaged when you mow it. These steps will ensure that your lawn sparkles after mowing it. While a lush lawn is not very difficult to acquire, you need to take appropriate steps to achieve it. As with other plants and greenery, a lawn too needs proper nourishment in the form of fertilizer. While there are many aspects to lawn care, one of the most important is to ensure that the correct fertilizer in the appropriate quantity is applied at the optimal time. When all three aspects of fertilizer application are taken care of, your lawn will be a welcoming sight whether you are coming home, entertaining guests, or relaxing there by yourself. There are a variety of fertilizer packages available for lawns. Before you buy a fertilizer, you need to get the soil tested to determine what minerals are lacking. You also need to get the acidity levels of the lawn checked and ensure that the soil quality is right for the grass to grow. Next, you need to decide whether you want to use chemical or organic fertilizer on your lawn. Organic fertilizers are made by composting garden and other organic waste or by mulching. This fertilizer can be used on most types of soil and extra application will not harm the lawn. Additionally, organic fertilizer will help improve soil quality by aerating it and also helping it retain more water. These qualities will reduce the need for frequent watering, enhance root growth, and stop the growth of weeds and pests. You can also save on fertilizer costs by composting garden and other organic waste in your home. Chemical fertilizers come in a selection of formulations. Effectively they have a mix of nitrogen, phosphorus, and potassium in different proportions. They are labeled NPK and the numbers that follow give the proportions of the three different minerals in the formulation. You need to choose the fertilizer mix that best meets the nutrient deficiencies revealed by the soil tests. While one can safely apply an abundance of organic fertilizers, chemical fertilizers should not be applied in excess. The amount of fertilizer you apply should be based on the soil tests. In general you can apply fertilizer twice a year to the lawn. The first and major application should be just before the winter or toward the end of fall to help the lawn survive the winter. The second application can be made at the beginning of spring if needed after testing the soil. If the soil is healthy, the lawn will grow during spring as it is the growing season without any additional application of fertilizer. Chemical fertilizers come in two types: the long lasting ones that are more beneficial and the quick acting fertilizer that can be used if you need to prepare your lawn quickly for a magnificent event such as a spring party or wedding. By taking care to apply fertilizer on the lawn after testing the soil you will be able to ensure its health over the long term. One of the essentials of achieving a green lawn is right watering. Lack of water can lead to bald patches, browning, and even more weeds in the grass. However, excess watering too can cause problems such as weak grass roots, presence of too many weeds, and growth of mildew. Apart from the quantity and frequency of watering, you also need to ensure that the lawn is watered at the right time to avoid mildew formation. The best time for watering a lawn is at dawn. The lawn should be watered before the day gets hot, but leaving plenty of time for the extra water on the blades to be dried by the sun. This will ensure that there is a lower risk of mildew formation, even as most of the water is absorbed by the soil. The frequency of watering a lawn is determined by the season and weather conditions. In the hot months you might need to water the lawn twice a week, while in spring and fall it is sufficient to water the lawn once a week. You need to test the soil to see if it is dry before watering the lawn. For instance, in a humid week, or when it has rained, you can skip or delay watering if the soil is still damp. Frequent watering will damage the lawn as the root will not grow deep. Moreover, weeds are more likely to grow under such conditions. Each time you water your lawn you should aim to make certain that about one inch of water falls all over the lawn. This can be checked by installing sprinklers and also small measuring containers to check that one inch of water has fallen all over the lawn. If the water starts running off before you have completed watering it to the one inch level, you need to stop and wait for the water to be absorbed before continuing. You might also need to add mulch to the soil to increase its capacity to hold water. By watering the lawn properly, you will be able to reduce the frequency of watering, ensuring deeper root formation, healthier grass, less weeds, and less mildew formation. The most efficient way of watering your lawn is to install sprinklers with timers. Once the sprinklers have been installed, you need to check how long it takes to water the lawn with one inch of water and set the timer suitably. After that you can switch on the sprinkler in the early mornings the day after you find that the soil in the lawn has become dry. As with other plants, watering is a vital part of lawn care. However, you need to be aware of and follow the right watering methods to ensure that the lawn flourishes without weeds, insects, and mildew. By spacing the frequency of watering adequately you will help the grass develop stronger and deeper roots. If you are not a property owner, when you see deer it is probably met with some feelings of awe and wonderment. However, if you are a property owner and you see a deer, it might be more likely that the sight is followed with an annoyed grunt while wondering what these animals are about to do to your landscape. Unfortunately as more and more land is developed, deer are having a hard time finding places to graze that do not overlap with where we humans live. Deer are basically harmless creatures, but they can destroy flower beds and other garden areas while trying to satiate their insatiable appetites. While some people are happy to have these majestic guests on their property, even putting out hay and corn to encourage revisits, others find them not only annoying, but costly as well since they will have to replant or replace the areas that have been eaten. If you happen to fall into the latter category, do not despair – there are manageable and nonlethal solutions out there! Here are some tips and tricks from landscaping experts on how to protect your garden beds and deter the reappearance of deer. Stonecrops is a plant not many people have heard of, but it is an excellent way to create color within your landscape without enticing deer to come and feast without abandon. The plant itself is extremely vibrant, sprouting orange, red, yellow, or pink flowers. In addition to not being on the menu for deer, stonecrops is also frequently implemented in many stone gardens, since the flowers offer contrasting colors against the gray colors of the stones. 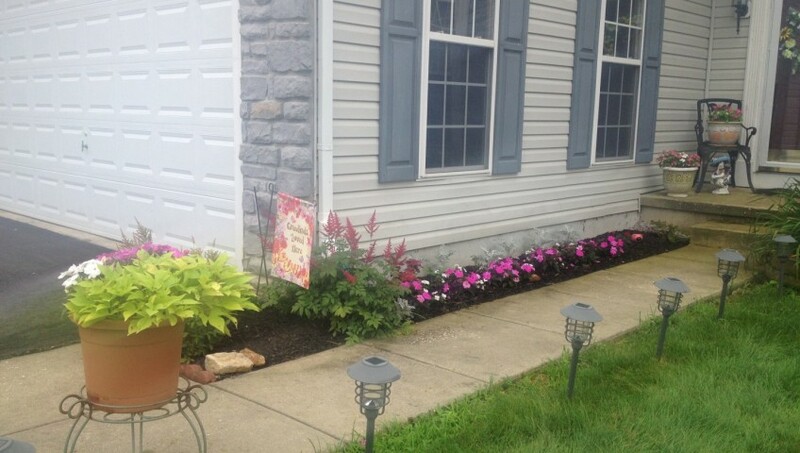 So with stonecrops, you are receiving dual benefits by planting something that will not appeal to deer, causing them to carry on to another property, and will also enliven your overall landscape with an abundance of color. Another plant that is helpful at keeping not only deer, but other nuisance animals away as well is the prickly pear cactus. This plant essentially offers the same advantages of having a barbed-wire fence around your landscape. However, instead of having a visually off-putting barrier, you have a beautiful plant doing the same job, as it grows magnificent yellow flowers that will catch the eye of any passer-by. Most animals are not looking to get jabbed or stuck, so they take great measures to avoid the prickly pear cactus; and if they do get jabbed or stuck, you can be assured that they will not be returning any time soon. but also will bring an abundance of color to your landscape. Deer have an extreme dislike for the taste and texture of this particular plant, so you are guaranteed that it will never be eaten by this particular animal. This plant grows as tall spikes with light purple flowers growing at the top. The foliage has a silver-ish hue, which looks great with the purple flowers. The foliage are also velvety to the touch, which is why deer find this plant unappetizing. Chances are these plants will do the trick in deterring deer from using your landscape as a buffet. The other positive is that your landscape will be overflowing with vibrant color that will add to its overall financial and aesthetic value. For more suggestions, check with your local landscaping expert. Planting trees and bushes and installing flower beds on your landscape is all fun and games until you catch sight of a terrible vision – a slimy snail or slug. In most gardens, this icky insect is ubiquitous. Your first instinct may be to run inside and get your salt shaker to bring a hard death to this particular insect, but before you do, let us learn about this insect, whether or not it does pose a valid threat to your plants, and how to go about eliminating it if it is a threat. First, what is the difference between a snail and a slug? A snail is easily identifiable by its protective shell, and to the layman, that is about all the difference between the two. Both snails and slugs are mollusks and have antennae and eyes, as well as a stretchable body which leaves behind a slimy trail. This sticky substance is an important part of a snail or slug’s existence, since they need to remain moist in order to live. This slime also helps them move around your landscape. So, are they a threat to your garden beds? The short answer is – YES! These insects can wreak havoc on your landscape, especially if you have fruit plants or trees, including tomatoes, strawberries, peach trees, etc. However, even if you do not have these specific types of plants in your landscape, you may still experience snails or slugs sliming their way up any structures located near your landscape, especially when the weather becomes cooler in temperature. One reason these bugs can become a huge problem is because they multiply quickly. These insects are hermaphrodites, which means they can reproduce all on their own. A snail or slug can lay close to 500 eggs in just one season (and by the way, snails and slugs can live up to four years, so you definitely want to nip this problem in the bud!) However, if you have your landscape treated prior to or during the warmer months, you can easily stop these insects from becoming a problem. So how do you get rid of these mollusks? Well, there is the old salt trick. However, landscaping experts actually discourage this method of elimination because while the snail or slug will surely shrivel up and die, the chemical makeup of the soil in your landscape will also be altered, which can create even more problems. One solution to eliminating these insects without the use of pesticides is beer. Apparently just like humans, they find the smell of beer appealing. They will make their way into the hopped up mixture and drown. However, the best way to tackle this problem is to deter the insects from appearing at all. There are a couple of ways to go here. First, you can remove certain plants from your landscape and replace them with plants that are not has alluring to snails or slugs. If you are committed to keeping fruit plants in your garden, you can look into setting baits and traps prior to the temperatures rising. If you are not sure where to find these garden-eating culprits, check inside your home or perhaps a backyard shed. These insects hibernate during the winter months and will often seek refuge inside your home, preferably in a dark, damp area such as a basement. Some of these traps actually use electricity which is beneficial if you are opposed to using chemicals to stop any infestations. There are also pesticides that can be employed. However, sometimes pesticides do not always do the trick and use of them can also harm insects that are beneficial to your landscape, or can also harm family pets or even children who might wander into the garden. If you are not sure which route is best for your landscape, call your local landscaping expert and receive professional advice you can count on!